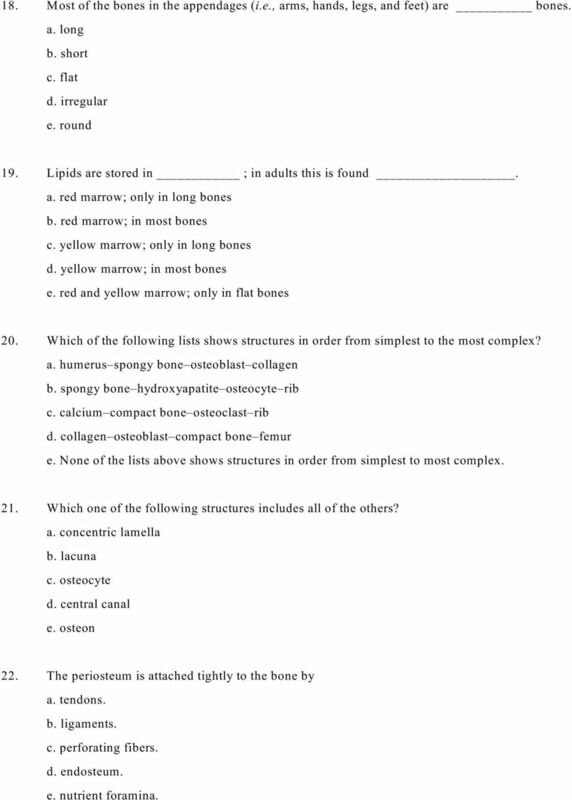 Download "Human Anatomy & Physiology I with Dr. Hubley. 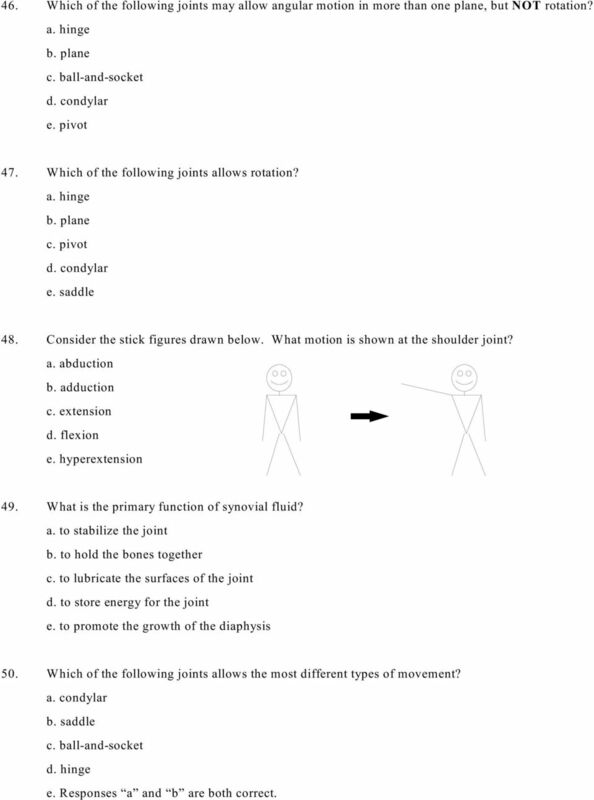 Practice Exam #2"
4 13. Which type of gland is typically functional in a 5-year-old child? a. ceruminous gland b. apocrine sweat gland c. merocrine sweat gland d. mammary gland e. More than one of the responses above is correct. 14. Which one of the following lists is in the proper order? 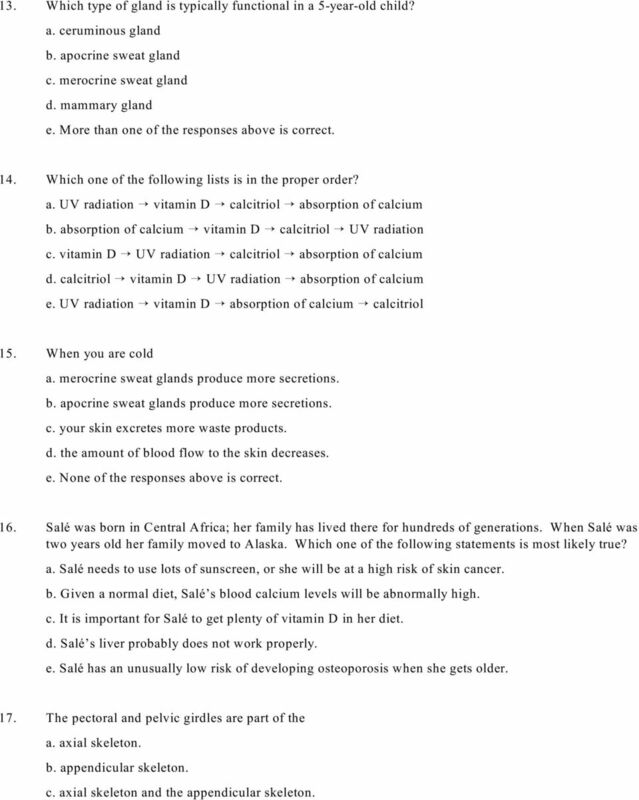 a. UV radiation vitamin D calcitriol absorption of calcium b. absorption of calcium vitamin D calcitriol UV radiation c. vitamin D UV radiation calcitriol absorption of calcium d. calcitriol vitamin D UV radiation absorption of calcium e. UV radiation vitamin D absorption of calcium calcitriol 15. When you are cold a. merocrine sweat glands produce more secretions. b. apocrine sweat glands produce more secretions. c. your skin excretes more waste products. d. the amount of blood flow to the skin decreases. 16. Salé was born in Central Africa; her family has lived there for hundreds of generations. When Salé was two years old her family moved to Alaska. Which one of the following statements is most likely true? a. Salé needs to use lots of sunscreen, or she will be at a high risk of skin cancer. b. Given a normal diet, Salé s blood calcium levels will be abnormally high. c. It is important for Salé to get plenty of vitamin D in her diet. d. Salé s liver probably does not work properly. e. Salé has an unusually low risk of developing osteoporosis when she gets older. 17. The pectoral and pelvic girdles are part of the a. axial skeleton. b. appendicular skeleton. c. axial skeleton and the appendicular skeleton. 5 18. Most of the bones in the appendages (i.e., arms, hands, legs, and feet) are bones. a. long b. short c. flat d. irregular e. round 19. Lipids are stored in ; in adults this is found. a. red marrow; only in long bones b. red marrow; in most bones c. yellow marrow; only in long bones d. yellow marrow; in most bones e. red and yellow marrow; only in flat bones 20. Which of the following lists shows structures in order from simplest to the most complex? a. humerus spongy bone osteoblast collagen b. spongy bone hydroxyapatite osteocyte rib c. calcium compact bone osteoclast rib d. collagen osteoblast compact bone femur e. None of the lists above shows structures in order from simplest to most complex. 21. Which one of the following structures includes all of the others? a. concentric lamella b. lacuna c. osteocyte d. central canal e. osteon 22. The periosteum is attached tightly to the bone by a. tendons. b. ligaments. c. perforating fibers. d. endosteum. e. nutrient foramina. 6 A B C E D For questions 23 through 25 select your responses from the letters above. 23. Which letter indicates trabeculae? 24. Which letter indicates a perforating canal? 25. Which letter indicates concentric lamellae? 26. Which one of the following statements is true? a. Diplöe is found only in long bones. b. Trabeculae are found in flat bones, but not long bones. c. Spongy bone weighs less than compact bone. d. All of the statements above are true. e. None of the statements above is true. 27. In a child, which type of tissue makes up part of a long bone, such as the humerus? a. compact bone b. blood c. hyaline cartilage d. All of the responses above are correct. 7 28. Collagen is the main ingredient of, and calcium phosphate is the main ingredient of. a. spongy bone, compact bone b. inorganic matrix, organic matrix c. concentric lamellae, interstitial lamellae d. inorganic matrix, hydroxyapatite e. osteoid, hydroxyapatite 29. The disease called rickets results from low blood calcium levels. A child with rickets often develops bowed (bent) legs. Why are the legs bowed? a. Low calcium makes bones less resistant to tensile forces (tension). b. The bones of a child with rickets are less resistant to compression. c. Bones with low calcium levels do not contain yellow marrow. d. Low calcium levels make the bones have too much hydroxyapatite. e. The child s testosterone levels are too high. 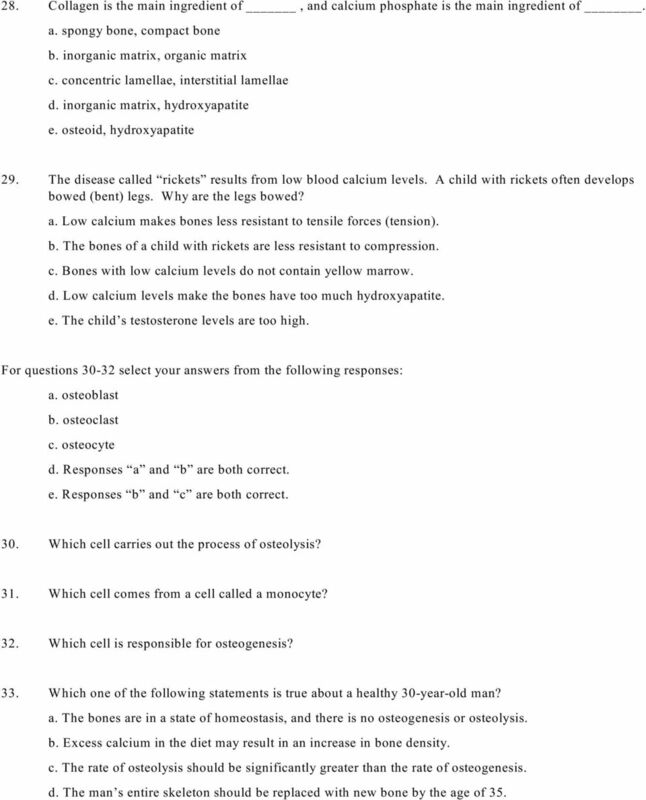 For questions select your answers from the following responses: a. osteoblast b. osteoclast c. osteocyte d. Responses a and b are both correct. e. Responses b and c are both correct. 30. Which cell carries out the process of osteolysis? 31. Which cell comes from a cell called a monocyte? 32. Which cell is responsible for osteogenesis? 33. Which one of the following statements is true about a healthy 30-year-old man? a. The bones are in a state of homeostasis, and there is no osteogenesis or osteolysis. b. Excess calcium in the diet may result in an increase in bone density. c. The rate of osteolysis should be significantly greater than the rate of osteogenesis. d. The man s entire skeleton should be replaced with new bone by the age of 35. 8 34. Emma is 65 years old, and her bones are weak. Recently she has lost her appetite, and her blood calcium levels have been falling. Which one of the following statements should also be true of Emma? a. Her thyroid gland is releasing more calcitonin to stimulate osteogenesis. b. Her parathyroid glands are releasing more PTH to stimulate osteolysis. c. To strengthen her bones, levels of both calcitonin and PTH will decrease. d. Levels of both calcitonin and PTH will be higher than normal. e. Her ovaries will begin producing higher levels of estrogen. 35. Which of the following factors may put an elderly woman at risk of osteoporosis? a. low levels of estrogen b. a diet low in calcium c. low levels of physical activity d. All of the responses above are correct. 36. Bill has fair skin and spends a lot of time in the sun. He eats a diet that includes plenty of calcium and phosphorus. Unfortunately, his liver has been damaged by disease and it is not producing calcitriol. Which one of the following statements is most likely true? a. Bill s blood calcium level is abnormally low. b. Bill s vitamin D level is abnormally low. c. Bill s calcitonin level is abnormally high. 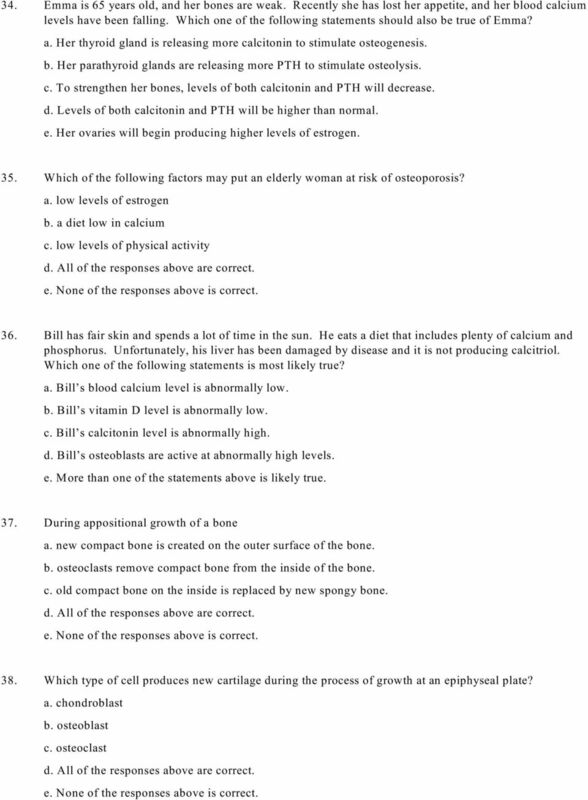 d. Bill s osteoblasts are active at abnormally high levels. e. More than one of the statements above is likely true. 37. During appositional growth of a bone a. new compact bone is created on the outer surface of the bone. b. osteoclasts remove compact bone from the inside of the bone. c. old compact bone on the inside is replaced by new spongy bone. d. All of the responses above are correct. 38. Which type of cell produces new cartilage during the process of growth at an epiphyseal plate? a. chondroblast b. osteoblast c. osteoclast d. All of the responses above are correct. 10 46. Which of the following joints may allow angular motion in more than one plane, but NOT rotation? 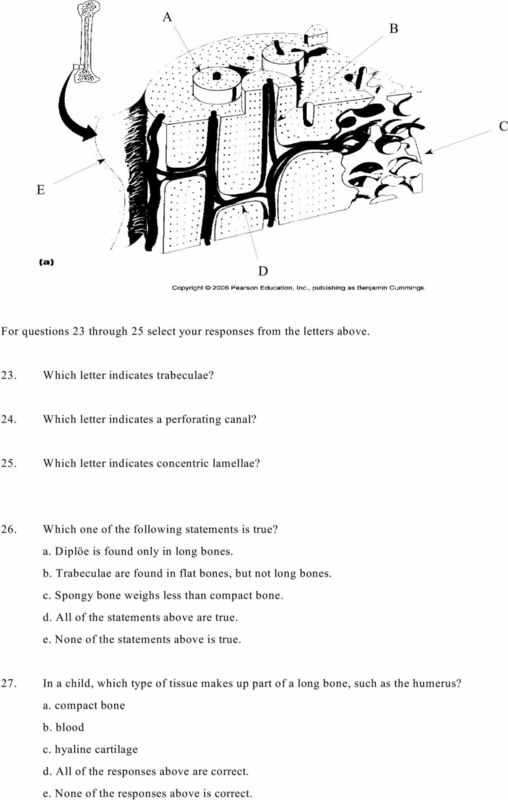 a. hinge b. plane c. ball-and-socket d. condylar e. pivot 47. Which of the following joints allows rotation? a. hinge b. plane c. pivot d. condylar e. saddle 48. Consider the stick figures drawn below. What motion is shown at the shoulder joint? a. abduction b. adduction c. extension d. flexion e. hyperextension 49. What is the primary function of synovial fluid? a. to stabilize the joint b. to hold the bones together c. to lubricate the surfaces of the joint d. to store energy for the joint e. to promote the growth of the diaphysis 50. Which of the following joints allows the most different types of movement? a. condylar b. saddle c. ball-and-socket d. hinge e. Responses a and b are both correct. 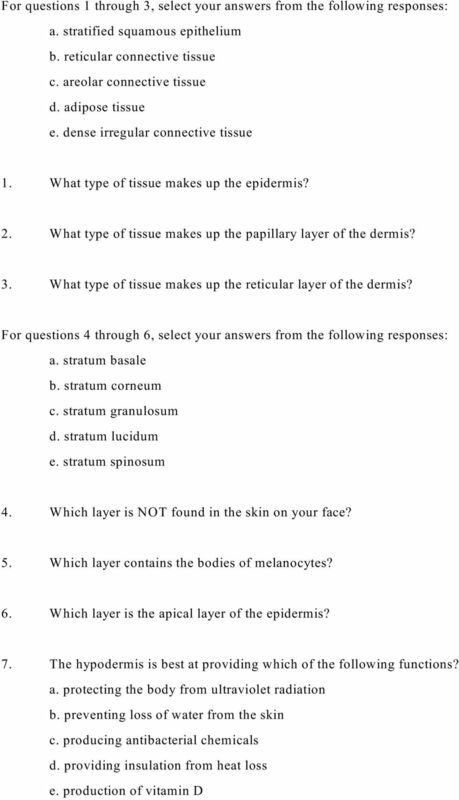 These are just some of the every day questions that are explained by skin anatomy. CHAPTER 6: INTEGUMENTARY SYSTEM. 1. Explain why the skin is called the cutaneous membrane. Chapter 5: The Integumentary System. What are the structures and functions of the integumentary system? 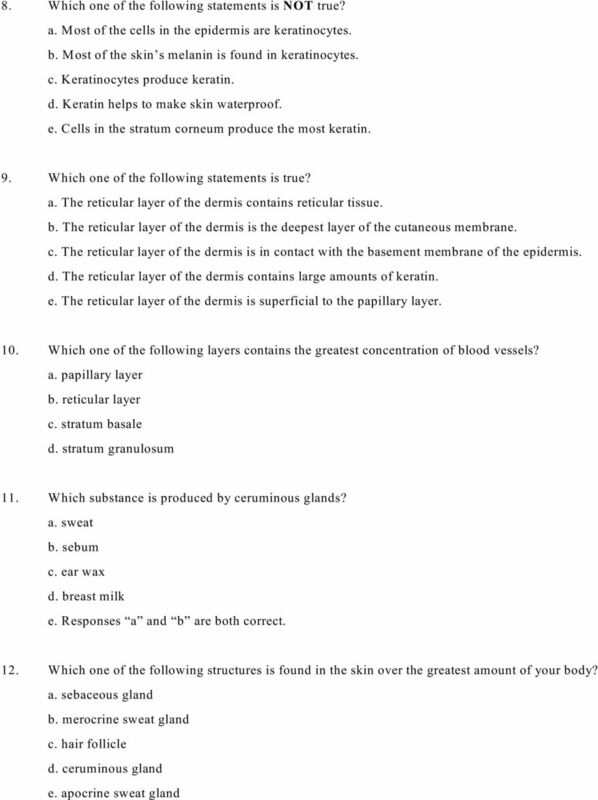 Chapter 5 The Integumentary System Lecture Outline Integument Composition 1. Cutaneous membrane A. Epidermis B. Dermis 2. Accessory organs A. Hair B. Exocrine glands C. Nails Functions 1. Protection 2.